Japan-based Joseph Auer's third release on Boltfish is a full length album of tracks influenced by places close to the artist's heart; Japan, London, Chicago, Detroit and New York City. "Spare, no-frills, 13-track space-music techno CD from this Tokyo-based artist comes on in retrograde, in the form of thudding, vintage-drum-machine-sound, early Rave done up in sad, melodious Ambience. Many of the treatments and sounds bring back fond memories of The Orb's U.F.Orb in particular, but these are no longer the glory days of '90s techno. Only track 2, "I Can Feel It Tonight," makes any effort to bend the boundaries of convention. There's nothing really wrong, here, it's just that the pounding, tribal rhythm paired with the lush chimes, echoes, uniformly-chorded synth progressions and offbeat scales makes for a puzzlingly incongruous blend. If you happen to be a more forward-thinking member of the musical populace, as far as Inner Galaxies is concerned you may wish for there to be more to the story. On the other hand, although Auer's intentions may be otherwise, this CD could be the perfect soundtrack for the world's loneliest rave. But seriously, this is not to knock it, because it's the kind of universe any number of folks could enjoy getting lost in -- you never know. " "Boltfish has issued more than its share of quality electronic music during the past few years but Inner Galaxies, a superbly crafted, hour-long collection of lush tech-house material by Japan-based Joseph Auer, may very well be its strongest release to date. On his third album, Auer, who works as an IT Software Engineer in Yokohama and lives with his family in Tokyo, draws upon cities of personal significance—Japan, London, Chicago, Detroit, and New York City—for inspiration. The Chicago-born Auer treats his titles seriously, too, with many of them matched to their aural content: layers of churning rhythms dominate "Industrial Funk," incessant barrages of electronic noises stream like meteor showers in "Inner Galaxies," and lustrous acid streams streak across the sky in "Starknight 303." Throughout the thirteen-song collection, Auer's multi-layered melodies unfurl iridescently while pulsating, sometimes tribal beats bump and roll. The album's jubilant spirit seemingly peaks with the penultimate "Love Disco Love (Analog House Mix)" and its sparkling fusion of electro motifs and disco-funk beats but then ascends even higher during the near-euphoric closer "Outer Galaxies." In true Boltfish spirit, Inner Galaxies' crisp material manages to be both accessible and melodic without compromising its integrity or quality." "Boltfish Recordings is one record label to come out of Britain which has managed to maintain a steady stream of high quality material. The label’s latest offering is no exception. Joseph Auer is the most recent artist to come to the Boltfish batch. 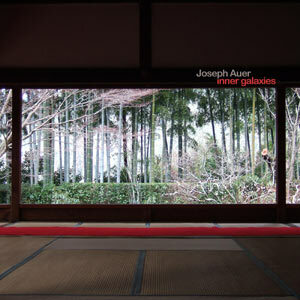 Auer comes here with his first full length endeavour, Inner Galaxies. But how has this release faired up in comparison to Boltfish’s reputable back catalogue? One thing which immediately hits home on listening to Inner Galaxies is the musical style that Auer has taken. In a sea of ever expanding electronica albums, singles and EP's, Auer has taken a step back into the roots of electronic music, techno. This is not pumping, noise bleed, speed techno, not by any means. This is techno, definitely Detroit and Artificial Intelligence influenced, that is soft, sometimes racy, melodic and extremely well constructed. The sounds that Auer has created hark back to the days of The Black Dog, B12, A.R.T. and Likemind. This is techno that is as elegant as it is interesting. The LP opens with "Club Sunrise II (extended mix)," a light, melodic, almost ambient, track to ease the listener gently into the world of Auer’s music. The album really starts going with the excellent "I Can Feel It Tonight" in which 90’s synthesized sounds twist and turn through some great basslines. A track that sounds like it could have been made fifteen years ago, with all of the feel and energy of those heyday tracks. "Hibiya Night" follows with a dubby feel, smooth bass that leads into aged analog slides. Auer keeps down the Detroit road throughout the album, echoing the likes of Stasis or Kirk DeGiorgio, whilst adding his own elements. Auer illustrates this in tracks like "Industrial Funk" where aggressive waves slice and dissect the track, cutting through the traditional Detroit sound. While the next track, the title track, "Inner Galaxies," is 90’s laid back techno through and through. The track rises softly and easily as light crisp beats bob and float in the backdrop. Synths simmer across the piece, producing a melodic, relaxing techno construct. Auer brings back the dubby sounds of "Hibiya Night" in track eight with "Skies Darken Over Chicago." This looping, almost house inspired number is as nulling as it is hypnotising. A lulling, droning, work with some real ambient influences; a respite before the acid homage that is "Starknight 303." "Starknight 303" is relaxed, an ambient techno piece with some superb TB 303 resonations. "Silicon Valley Summer Days" maintains the easy going feel of the album's latter section. A warm, reverberating work of slight squelches, and gentle beats. "Save Our Love" builds up the tempo once more. Sharper, more dancefloor driven beats shape the track, while the melodic synthlines of the album continue. The solidity of "Save Our Love" moves into "Love Disco Love (Analog House Mix)," a housy electro style track that keeps those dreamy synths echoing and the beats crisp. The album ends in the same upbeat mode as its last two predecessors. Well constructed, bassy chords skate across a pond of icicle like snares. An excellent track to end an excellent album. "Mike's album of the week. Bosh. There you have it. A CD of extraordinary beauty, grace and lushness. Joe Auer delivers yet another justification for my continuing love affair with Detroit Techno with this simply sublime collection of tracks. From the opening moments of 'Club Sunrise II' you know this is going to be deep and, true to form, the whole album is so full of sweet chord progressions, subtly groovy percussion and some delicious melodic content that you'd be hard pressed to fault it in any way. You've just got to love the way he's put these tracks together to appeal to the vintage Motor City conossieur as well as fans of good music in general. Simple, effective and very, very beautiful indeed... I'll say no more except that you should own this *immediately*. Awesome. Keep your eyes peeled for a forthcoming Smallfish 3" release from Joe!." "Although his name implies something different, Joseph Auer hails from Japan and 'Inner Galaxies' is his third release on Boltfish. I didn't hear the previous two, but this one is quite a nice stomping house thing. At the centre of Auer's music is the rhythm box pleasantly banging away, with a wave of electronics around it. I am not really a dancer as such, so as for home entertainment this might be a bit too much for the floor with the heavy bass sound, even when this is not pressed on DJ friendly vinyl. Some of the synth parts are perhaps a bit too dominant for the floor, but throughout this is a very nice and very straightforward piece of house music. And even when it's not really my cup of coffee, I did enjoy this quite a bit. " "Mr Auer is back on Boltfish Recordings with another full-length album this and it is entitled "Inner Galaxies" and it’s the next scheduled release due anytime now (OCT 2006). On "Inner Galaxies" Auer continues his relentless examination and development of drum machine-based music deeply rooted in the house realms and few are doing it as successfully as he is. Sounds being perfected and many of the tracks are bass heavy and all undeniably moving forward. The house influences are showing clearly on this release, it’s straightforward, yet rich sounding, very versatile, hard sounding and soothing but make no mistake the direction is as clear: towards the curious part of any dance floor. It has been said before, but it deserves repeating: what lies behind the beats and production is pure craftsmanship and genuine love for the music, just like you would expect from Mr Auer. Conclusion: Auer + Boltfish = unstoppable!."